If you had a magic wand, what would you do to your teeth? Now there is a fairly good chance that the word ‘whiter’ cropped up in your answer. If so, then you are not alone. This﻿ sur﻿vey demonstrated that most people deem pearly whites to be a ‘must have’ for a prospective partner. What are the Different Ways to ﻿Whiten ﻿Your Teeth at Home? This is the ‘gold standard’ technique and probably the most common way to whiten your teeth in the comfort of your own home. Custom moulds are taken of your teeth by your dentist. More on this process further down in the article. This is a very popular way to whiten your teeth, due to the fact that they can be bought over the counter (or online), and is therefore cheaper than the custom tray option. However, because the trays are not made by a professional to fit the exact shape of your teeth, there is a chance that you could end up with an uneven result, or inadvertent damage to your gums with overuse. Visit our teeth whitening kit reviews page here for more information and ensure you follow the manufactures recommendations. If your budget is limited, simply buying strips or toothpaste that purport to whiten your teeth may make some difference to the shade, but be warned that the results are likely to be very minimal when compared to custom trays. This large-scale study found no sound evidence to support the use of whitening strips over custom trays. Use with care! A Plethora of websites suggest using lemon juice or baking soda to whiten your teeth, as some sort of natural alternative to the substance your dentist will prescribe. These materials are at best ineffective and if overused or used incorrectly: dangerous to the enamel on your teeth. So does that mean that Holistic practitioners and beauty therapists shouldn’t be in the business of whitening teeth? Think about it this way; if your car needs repaired, you take it to the mechanics, not the butchers. If your teeth need improving, go to your dentist, not the beautician. So now that we have established that white teeth are a cornerstone of attractiveness, and the obvious way to whiten at home is custom trays, let's outline what is involved in this technique. What’s Involved in Custom Trays? Your dentist will check that you are a good candidate for whitening in the first place, by making sure that you don’t have any fillings that need fixed before you start. They will also make sure that your medical history doesn’t preclude to the use of whitening gel in the mouth. The active ingredient in the whitening gel is either hydrogen peroxide or carbamide peroxide. They work by removing just the outer ‘stained’ layer of enamel. This is why it is so important to get a dentist to oversee the process, as they will be able to make sure your teeth do not demineralise/weaken or become too sensitive. They may suggest special toothpaste called tooth mousse to prevent sensitivity. There are many different brands of gel and concentrations of peroxide/bleach in those gels, and it’s all about finding your ‘goldilocks zone’ – a concentration of bleach which will be strong enough to give you the results you want, but not so strong that it may damage your teeth. I found the best results using polanight 16% carbamide peroxide gel. In my private practice I regularly prescribed this to patients, because it gives the option of either wearing the trays with gel in place for 90 minutes, or overnight if you wish. You simply brush you teeth, place the gel in the tray, ‘seat’ the tray, wipe away the excess gel, and wait the allotted time. Afterwards it’s a simple process of rinsing your mouth thoroughly, placing tooth mousse topically on your teeth for about half an hour and then brushing your teeth again with sensodyne. I found this regimen resulted in the best results with very little issues of sensitivity or any damage to teeth or gums at all. How Long Should You Whiten Your Teeth For? It depends how white you want them! I would advise you aim for a subtle change that complements your skin tone and age. It normally takes people about 3 – 4 weeks of daily use to get a change they are happy with. Make sure you get before and after photographs, as whilst the change may seem gradual to you, you will be amazed by how much whiter they are on careful comparison! Avoid the temptation to go overboard, as the results can be, well, a bit over the top﻿﻿! Arrange a consult with your dentist to discuss home whitening. They will let you know if you are a good candidate and also will outline pros cons and costs involved. If indicated, DO IT! You won’t regret it. If you can’t afford that, try a whitening toothpaste. Avoid heavily stained foods (like red wine, curries and coffee) as much as possible. DON’T use weak household acids or any other quackery. So there you have it; a simple, actionable plan for whiter teeth – and you don’t even need a magic wand! WANT A HOME WHITENING KIT THAT ACTUALLY WORKS? 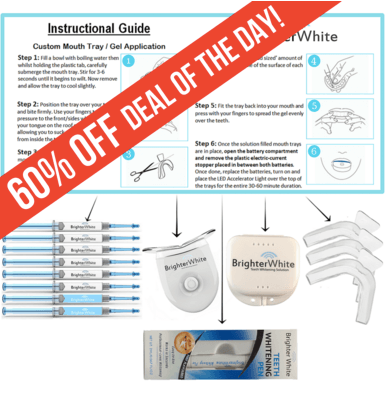 The Brighter White Teeth Whitening Kit was recently reviewed as the best kit in Australia - Don't miss their 60% off sale right here. Looking For A Home Teeth Whitening Kit That Actually Works? Take A Look at The Brighter White Home Kit - One Of Australia's Favourite Whitening Kits - Which is Currently On Sale! Take advantage of their current 60% Off Sale Before It ends!